You know how much I love an army jacket, and this fall's MAR x Clare V. jacket was quite a hit! So in the spirit of every-season-deserves-a-(M)ARMY, I teamed up with my girls at Goop, to deliver one that's truly next level! A polished, enduringly stylish topper that will make any outfit look "done." 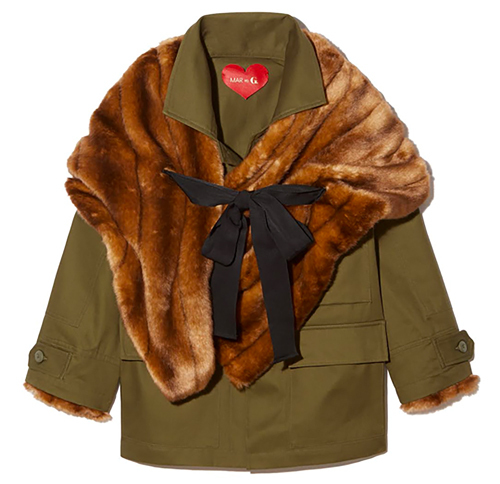 It comes with a removable faux fur stole (that can punctuate a holiday cocktail dress like nothing else, BTW) and cuffs, so that it can be worn year-round. It's basically a three-in-one, one-size-fits-all jacket that's pretty genius. And it's limited edition, so if you want one, better make a beeline here.